There are different kinds of rechargeable batteries. The most common type is the lead-acid battery. A less familiar one is the nickel-cadmium (NiCad) battery, which can still often be found in old emergency power systems. Due to the high charge voltage required by a NiCad battery, and the fact that they are very environmentally unfriendly, these batteries are not suitable for use onboard a vessel or car/truck. To recharge the battery, an external power source - such as a battery charger, alternator or solar panel - with a voltage of around 2.4 V per cell must be connected. The lead sulphate will then be converted back into lead and lead oxide, and the sulphuric acid content will rise. There are limits set for the charge voltage to prevent the release of an excessive amount of hydrogen. A charge voltage of more than 2.4 V per cell, for instance, releases a lot of hydrogen gas, which can form a highly explosive mixture with the oxygen in the air. Different types of battery – in terms of the thickness and number of plates per cell – correspond to different applications. The maximum current that can be delivered is determined by the total plate surface. The number of times that a battery can be discharged and recharged – the number of cycles – depends on the thickness of the plates. A battery can feature either many thin plates or a few thick ones. A starter battery has many thin plates per cell, leading to a large total plate surface. This type of battery is, therefore, suitable for delivering a high level of current over a short period of time. The number of times that a starter battery can be heavily discharged is limited to around 50-80. But as starting the engine uses only a small part of the energy stored (around 0.01 %), the battery lasts for many years. This type of battery is generally unsuitable for cyclic use. Until recently, Lithium Ion batteries were mainly available as chargeable batteries with a small capacity, which made them popular for use in mobile phones and laptops. 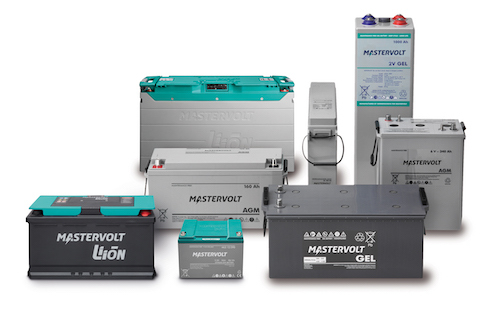 Mastervolt offers Lithium Ion batteries with large capacities. Our Lithium Ion batteries have a high energy density and are perfect for cyclic applications. 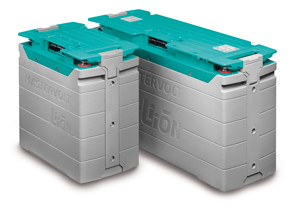 Compared to traditional lead-acid batteries, Lithium Ion batteries offer savings of up to 70 % in volume and weight, while the number of charging cycles is three times higher than semi-traction lead-acid batteries. An added benefit is that Lithium Ion batteries can supply a constant capacity, regardless of the connected load. 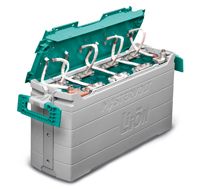 The available capacity of a lead-acid battery is reduced in case of higher discharge currents. Lithium Ion batteries can be discharged to 80 % without affecting their lifespan, whereas lead-acid batteries are more affected by deep discharge. Compared to traditional open or lead acid batteries, the Lithium Ion batteries offer even more benefits, such as a much larger power density and a longer lifespan. And because lithium is the lightest metal, Lithium Ion batteries are also more lightweight. They can also be charged at any time, while nickel-cadmium batteries require complete discharge for an optimal performance and to prevent memory effect. Furthermore, Lithium Ion batteries can be charged with a very high current, up to 100 % of the capacity, resulting in a very short charging time and no memory effect. 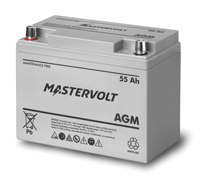 Mastervolt Lithium Ion batteries are equipped with a Battery Management System. The system keeps all the individual cells perfectly balanced, resulting in a higher capacity and longer lifespan. A semi-traction battery has fewer but thicker plates in each cell. These batteries supply a relatively lower starter current, but can be discharged more often and to a greater extent (200 to 600 full cycles). This kind of battery is highly appropriate for the combined function of starter and service battery. This type of battery has even fewer, but very thick, flat or cylindrical plates. It can therefore be discharged many times and fairly completely (1000-1500 full cycles). This is why flooded traction batteries are often used in forklifts and small electrical equipment such as industrial-grade cleaning machines. But flooded traction batteries require a special charge method. Because these batteries are mostly tall, they are sensitive to the accumulation of sulphuric acid at the bottom of the battery container. This phenomenon is called stratification and occurs because sulphuric acid is denser than water. Acid content increases in the lower part of the battery, locally intensifying plate corrosion, and decreases in the upper part, reducing capacity. The battery is discharged unevenly, significantly reducing its lifespan. In order to spread out the acid evenly again, the battery has to be purposefully overloaded using excessive voltage. This generates a large amount of hydrogen gas, which will form a dangerous mixture with oxygen in the air. The voltage required to recharge these batteries is around 2.7 volt per cell, or 16.2 volt for a 12 V system and 32.4 volt for a 24 V system. 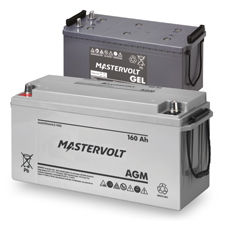 These high levels of voltage are extremely dangerous for the connected equipment and the large amount of gas generated makes these batteries unsuitable for use in vessels and vehicles, except for propulsion.